Learn why the Aegis Microbe Shield System is better than others. 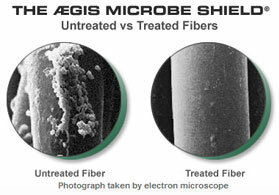 The unique AEGIS Microbe Shield is a fabric enhancement that gives the treated surface active antibacterial action. The germ-killing action is the result of a micro polymer coating, which mechanically destroys bacteria, mold, fungus and their allergens on contact. AEGIS contains no chemicals, is not consumed by microorganisms, and remains effective for the life of the product. Unlike other antibacterials, the AEGIS Microbe Shield does not promote the adaptation of microbes. AEGIS is inert, hypoallergenic, and non-toxic. As the diagram on the right shows, Aegis Microbe Shield acts as a layer of swords to defend against microbial growth. Because of their exceptional chemical bond (a covalent bond) the bonded polymer is neither soluble nor volatile. 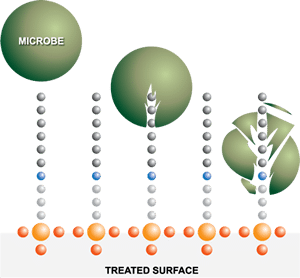 The unique bond results in the ÆGIS antimicrobial polymer becoming an integral part of the substrate.